You don't need to take a long wilderness hike to watch wildlife. Black-billed magpies, common Anchorage birds you can attract to a feeder come winter, provide hours of fascinating (or annoying) wildlife watching. The black-and-white birds have a sweeping black tail that's longer than the rest of the body, said Rick Sinnott, Anchorage area biologist for the Alaska Department of Fish and Game. Their black feathers have a glossy sheen, giving them a green or purple look up close. But their appearance is just one reason the birds are entertaining. Magpies sometimes seem to have a bit in common with teenage boys -- engaging in aggressive, sometimes risky stunts like pulling hairs out of a cat or dog tail, then flying away. "They'll know just how far a dog can reach on its chain," Sinnott said. This behavior -- tweaking a potential predator -- is intended to impress other magpies watching from a safe distance. Magpies will sometimes squabble among themselves, particularly in the late winter and early spring when a nonbreeding bird deliberately crosses another bird's territorial boundary. 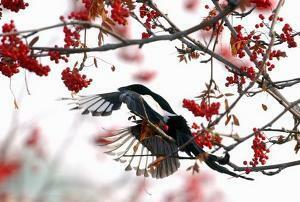 The fracas attracts other magpies, and the chasing and noisy chatter spreads from the ground to birds in the treetops. "They act and sound like spectators at a hockey match," Sinnott said. The original two birds may wind up rolling around on the ground, pecking each other. Usually the intruder retreats, but sometimes it manages to squeeze in a nesting territory of its own, between other nesting pairs. Magpies aren't fussy eaters. They'll snack at bird feeders, especially those stocked with peanuts or suet, and will eat all sorts of other foods, including roadkill, insects, berries, Chinese food and french fries. They can quickly empty a bird feeder, returning repeatedly and caching each beakful nearby. They seem to be able to remember the location of hundreds of temporary food caches. In the Anchorage area, magpies nest in birch trees, often building bulky stick nests several feet in diameter. They squawk a strident alarm call, which sounds a little like "mag, mag, mag," anytime terrestrial predators get too close. That includes dogs, cats and humans. Magpies defending a nest, or more typically their awkward fledglings, may swoop down at people, occasionally smacking someone in the head. Sinnott said he's never heard of anyone being seriously injured by a magpie. They are only about twice the size of a robin. Every now and then someone will propose a magpie hunting season because of their raucous behavior and because they occasionally eat songbird eggs and nestlings. But Sinnott figures any bird tough enough to stick it out through an Alaska winter has earned our respect and admiration. "Really, they're no worse than New Yorkers," he said. "They're kind of obnoxious, but you've gotta love them for what they are." EYEBALL MORE: For information on wildlife viewing in Alaska, go to www.wildlifeviewing. alaska.gov.